Krazy Krouse Kids: Thomas Yogurt Rocks! Here are some shots of the kids eating the infamous "Thomas yogurt." 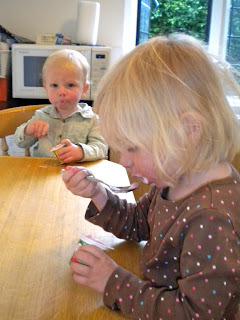 They love the strawberry yogurt mainly because "it tastes like Thomas." The container is a little smaller than normal, so Caroline usually eats 3 at a time! 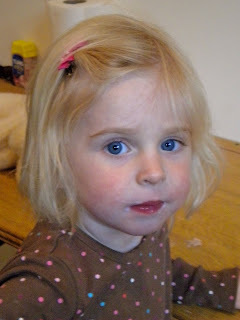 Last night she ate 5 containers of yogurt! Tucker is learning to feed himself when Mommy is feeling brave and prepared to clean up a messy boy, counter and floor!